We are pleased to announce DECL’s participation in the Outdoor Summer Community Swim Program, at locations around central Edmonton, FREE with your DECL membership! To purchase a current $5 DECL Membership, please visit efcl.org. 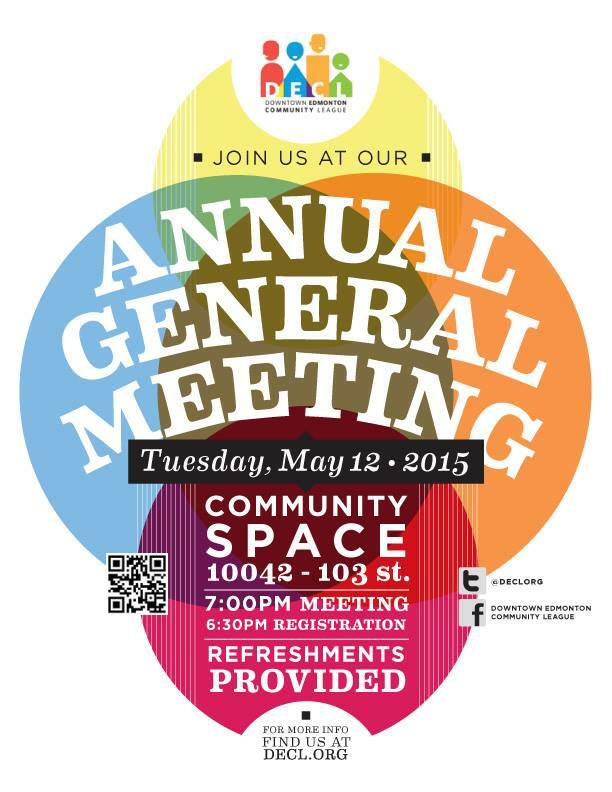 Join us at our community space for our Annual General Meeting 2015! We will be discussing downtown issues, going over the business of the league, as well as hearing updates from some of our committees, partners, and special presentations! 2) EPS Superintendent Graham Hogg. Inspector Hogg will be talking about the changes to Downtown Division, and EPS’s preparations for the new Arena District when it opens. We will have a few board positions opening up. If you’re interested in getting involved in your community, passionate about Downtown, and have 2-3 hours a week to commit to volunteering activities, please consider joining our board. If you have questions or would like to submit yourself for nomination, please email us. $5 2014-2015 DECL memberships will be available at the door. Come on down, get to know your neighbours, get to know what’s happening in your vibrant downtown community! Light refreshments will be available. Cash bar. Have you heard of Pogo CarShare? 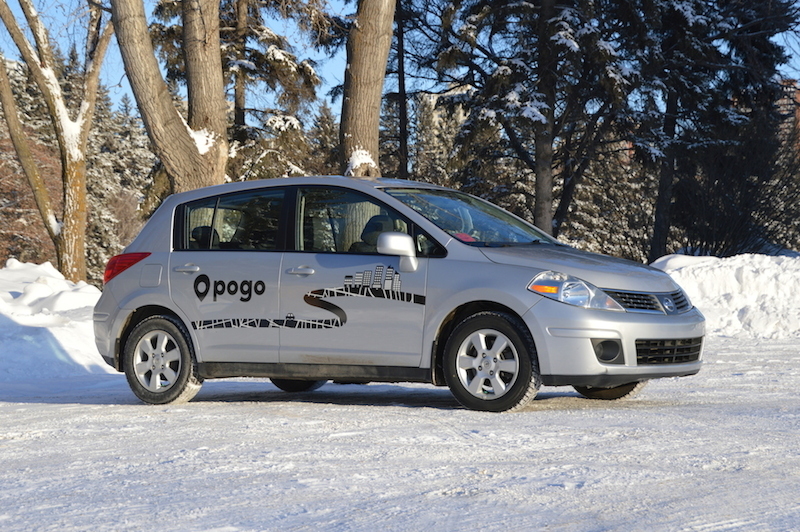 Pogo is Edmonton’s new car sharing service. Affordable, convenient and flexible for one-way trips. We are excited to announce a partnership with Pogo CarShare to provide discounts to DECL members! Use promo code ‘DOWNTOWN’. Sign-up is FREE and first trip is also FREE*! Join us for another General Meeting for DECL members. We will be getting together to discuss the on-going business of the league and downtown issues at large. It’s your chance to find out what’s going on in your community, share your thoughts, questions, and ideas, and meet your neighbour! 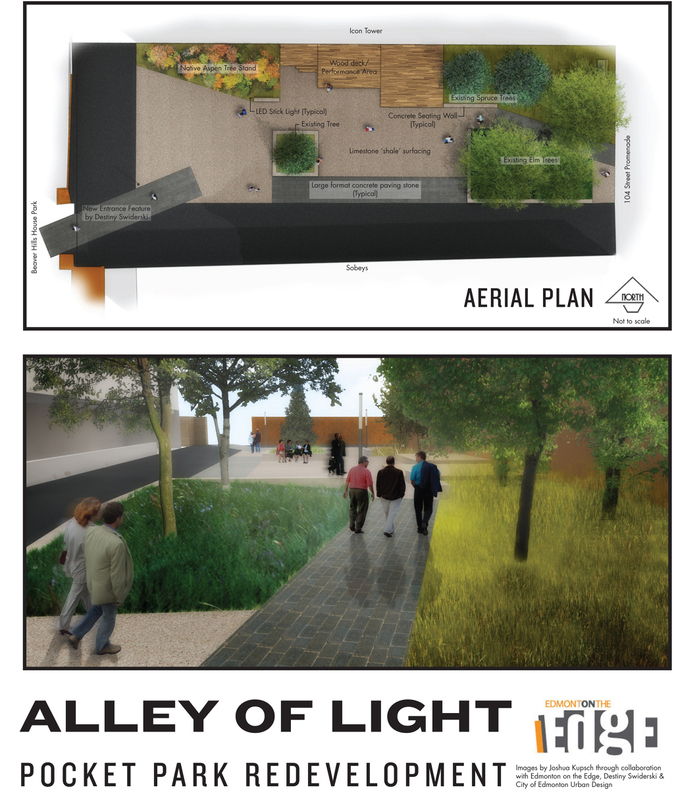 Representatives from the City of Edmonton will be on hand to discuss the final design for Alex Decoteau Park to be built in the Warehouse Campus Area! We will also be getting a quick update from Ward 6 Councillor Scott McKeen. $5 2014-2015 DECL Memberships will be available at the door. Light refreshments & cash bar will be available. 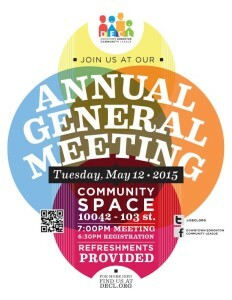 Note: Our Annual General Meeting will be held on May 12, 2015. Details to come! Join us for our annual Holiday Mixer, a time for downtown residents and community league members to celebrate living downtown and meet other members of your neighbourhood. A time to be merry! This year’s festivities will again be ugly sweater themed! Wear your boldest and brightest holiday fashions! If you’d like to bring some holiday baking, feel free to share! Light refreshments and seasonal beverages provided. Cash bar also available. You must be a DECL member to attend. $5 2014-15 memberships will be available. Join us for our second General Meeting for DECL members. We will be getting together to discuss the on-going business of the league and downtown issues at large. Godfrey Huybregts, Communications Consultant for the Edmonton Galleria Project, will be our special guest. Join us for our Annual CornFest on Saturday, September 6, 11 am – 3 pm at Beaverhills House Park! 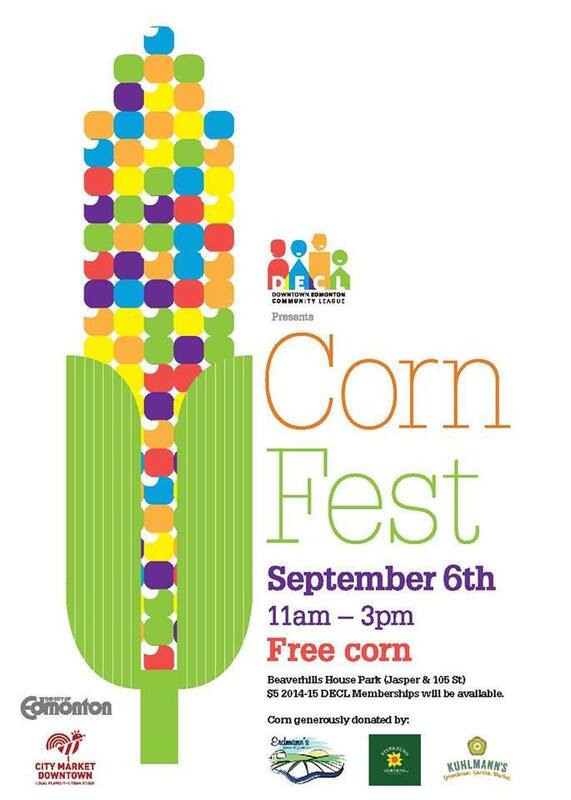 Enjoy free Alberta corn-on-the-cob, crafts for kids, and music. Greenspectacle.com will be transforming corn husks into beautiful fashions. Come on down and meet your downtown neighbours! This event also kicks off our annual membership drive. Find our DECL booth and get your 2014-15 $5 membership! Renewing members will be entered for door prizes! If you’d like to help out by volunteering, please contact us. Although much time has been spent on getting the strip park behind Sobey’s redeveloped, the first stage will begin in the next few days! The City of Edmonton has awarded a contract to Paving Stone Plus and construction will likely begin in the week of July 28-August 1. The work to be undertaken includes removal of existing paving stone, concrete curbing and paving, granular surfacing and amenities and will be replaced with new lock stone, concrete verge with standard and LED light up bollards, retaining walls, power distribution box, security lighting to match 104 Street, bistro chairs and tables (seating for 64), garbage receptacles, shrub and tree planting with bark mulch and irrigation. It will take some time before all of the work is completed. The decision and announcement by Sobeys yesterday to close their popular 104 Street store downtown was met with shock and bewilderment. Having a walkable grocery store downtown is often heralded as the success of revitalization efforts in our core, that drawing residents back to live downtown was hitting a certain threshold. Our downtown was becoming a neighbourhood in its own right. Sobeys Urban Fresh concept was a new ‘urban format’ for the chain, one we all embraced when it was announced in 2006. Sobeys has been an important community partner in the past for us, and why we are sad to see it leave. With the announcement of many stores closing Canada-wide, including two ‘Urban Fresh’ concept stores in Toronto, it’s hard not to question corporate motives for this decision. This closure, while upsetting, will not stop the growth and revitalization of our downtown. As we hope for an equal or better grocer in that space to anchor 104 Street and serve downtown, there certainly will be further opportunity to fill voids in food retail in Edmonton’s downtown as it develops and matures. Join us again this year for the kick-off to ‘Super Saturday’ downtown by starting your day with some pancakes and sausages! $2 breakfast goes to support the on-going programming efforts of DECL. 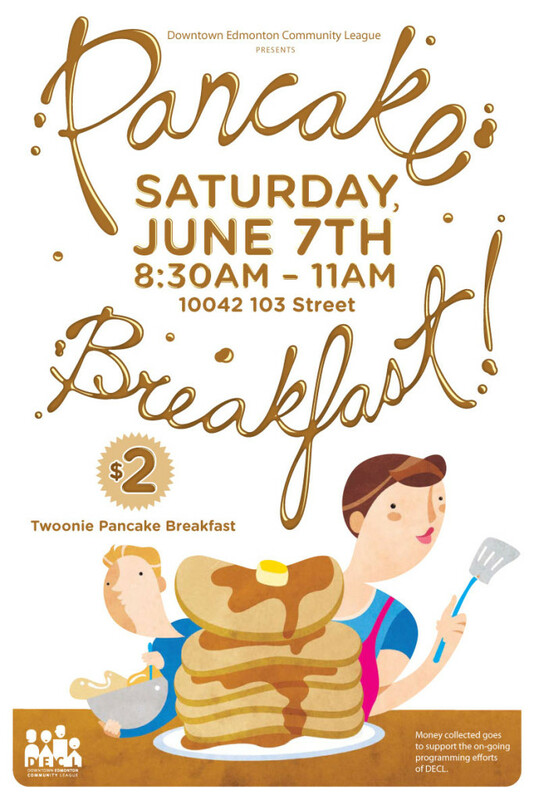 This year’s breakfast will take place right in front of our new community space at 10042 103 Street from 8:30 am to 11:00 am. We’ll be closing off part of 103 Street and setting out lots of picnic tables for all to enjoy! We’ll be done in time for Downtown and Oliver Community Leagues to take part in Pride Parade 2014 for the first time! Stay and enjoy the rest of the day at the City Market 9-3, and Pride Week festivities in Churchill Square in the evening! We need your help! If you’d like to volunteer for the pancake breakfast or join our contingent in the parade, please message us or email us at my_decl@telus.net! This could be another widget!